On April 12th, 2012, Azerbaijani Students Association (ASA) organized a public forum dedicated to the history and legal aspects of Nagorno Karabakh conflict. The event was held at University Center of University of Houston. 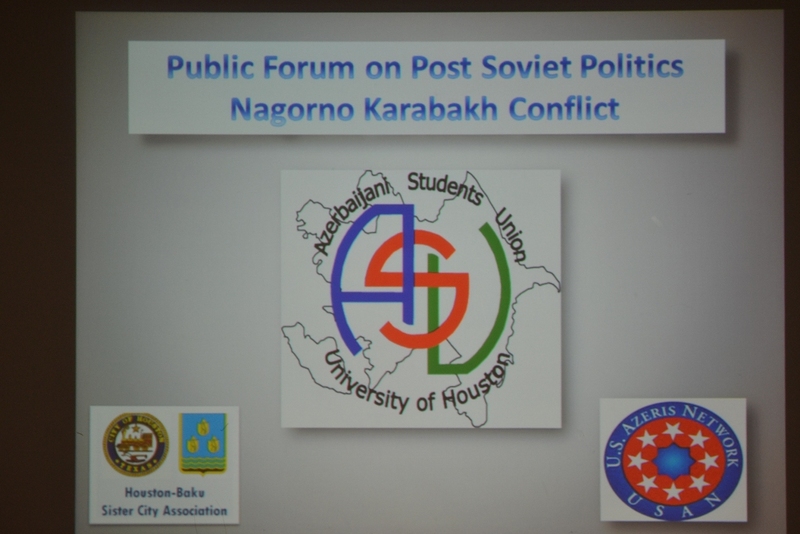 The main purpose of the event was to educate UH student body about history of Azerbaijan and provide a forum for public discussion on political, social and ethnic roots of Nagorno Karabakh conflict. In her opening remarks, the president of ASA, Mehriban Efendi, mentioned that forum will focus on three main subjects: ethnic history of Caucasus, modern history of Azerbaijan and collapse of Soviet Union and roots of Nagorno Karabakh conflict. Professor of Political Science at University of Houston Ryan Kennedy spoke about frozen conflicts, as remnants of the collapse of Soviet Union, providing background information on political, economic and social implications of inter-state conflicts. His presentation was followed by Yusif Aleskerov’s presentation on ethnic history of Caucasus, focusing on various periods of rule in the South Caucasus and providing background information on the ethnicity debate between Armenians and Azerbaijanis pertaining to ethnic identity. Kamran Zahid, the founder of Azerbaijani Student Association and University of Houston alumni, focused on challenges of Azerbaijan as a country in the first two decades in the history and drawing parallels between modern Republic of Azerbaijan and Azerbaijan Democratic Republic (ADR, 1918-1920). Yusif Babanly, co-founder and Director of U.S. Azeris Network focused his presentation on the legal aspects of Nagorno Karabakh conflict, arguments of sides and the role and stance of the international community in the ongoing negotiations. The forum was concluded by Riad Efendi, Vice President of Houston Baku Sister City Association. His presentation focused on the lookout in the future and possible outcomes of this conflict. Azerbaijani Students Association was founded in 2006 by Kamran Zahid and seeks to educate students at University of Houston about Azerbaijan’s culture and history. Its current president is Mehriban Efendi, MBA student at Bauer College of Business. The forum was co-sponsored by Houston Baku Sister City Association and U.S. Azeris Network. This entry was posted in News by houstonbaku. Bookmark the permalink.